It can be hard to know how much water your vegetables need, and how much is too much! Watering the garden isn’t an exact science, but it is possible to work out how much water plants are getting, and how much you’ll need to add to keep them in good health. The first step is to figure out how much water your vegetables are getting. This will help to alleviate your fears that your plants aren't getting enough to drink, and serves as an approximate indicator of when additional water might be required. The easiest way to find out exactly how much water your vegetables are getting is to use a rain gauge. Choose one with a wide collector funnel and long measuring cylinder. This improves the accuracy of the reading while reducing the risk of any splash back. An extra option is a mesh filter to keep leaves, bird droppings and other debris from clogging up the inside. Where you position the rain gauge is important. Set it up on a pole (good models should come with one) so that the collector funnel is about a metre, or three feet off the ground. Place the gauge well away from other objects and, of course, avoid overhanging foliage, which will either shield or concentrate rainfall. Open areas like a lawn are ideal. You want to find out how much rainwater is falling over a week. In most cases reading the gauge at the same time of day, once a week, is sufficient to build up a workable picture of rainfall. But in circumstances where every drop counts you shouldn’t overlook the contribution made by atmospheric moisture such as mist, fog and dew. It isn’t rain, but it still delivers useable moisture to your plants. To measure atmospheric moisture you’ll need to take daily readings, early in the morning before it evaporates. Don’t forget to empty the rain gauge after each reading to reset it. A good flick of the wrist ejects any droplets clinging to the sides. That takes care of the wet stuff coming out of the sky. But if you sometimes use a sprinkler to top up rainfall, it makes sense to understand what your sprinkler delivers during each use. Sprinkler output only needs to be measured once, then in future you can calculate exactly how long to leave it on for in order to deliver a specific volume of water. To measure, place your rain gauge so the collector funnel lies entirely within the trajectory of the sprinkler, clear of any obstructions. Leave the sprinkler on for exactly 20 minutes (time it!) then measure the volume of collected water. 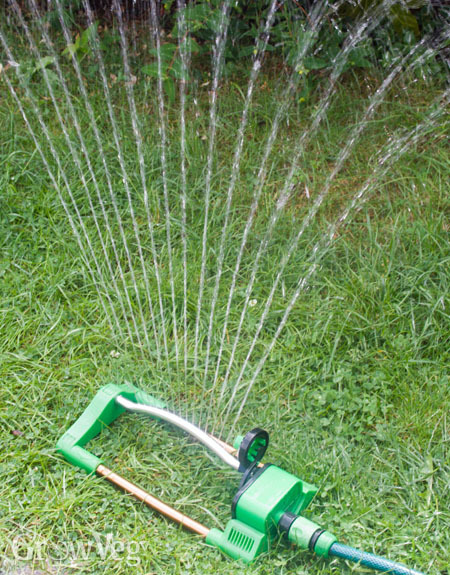 Multiply by three to give your sprinkler’s hourly output. Having said all that, it’s worth considering more efficient alternatives to sprinklers, including drip irrigation or soaker hoses that deliver water more effectively, with less runoff or evaporative loss. I mentioned earlier that watering is an inexact science, and the truth is the volume of water required depends on many variables such as what’s growing, your soil type and of course, the weather. The general rule of thumb is that most vegetables need about an inch (25mm) of water a week. This doesn’t take account of soil type though, so if you have a clay soil that holds onto moisture, you’ll probably need a little less, while a free-draining sandy soil may need more. How much also depends on the average daily temperature, worked out by adding together the daytime high and low then dividing by two. The inch-per-week rule is based on a comfortable daily average of around 15°C (60°F). Warmer averages mean more water to the tune of an additional half-inch (13mm) with every rise of 6°C (10°F). You can appreciate why gardeners in hot climates must water considerably more than those lurking in the cooling murk of a maritime climate such as Britain or the Pacific Northwest! The above are very, very (did I say very?) approximate guidelines. Don’t be a slave to them but instead rely on your senses and how your vegetables are actually faring. Here are four tips to help you go easy on the water and make the most of what you do apply. 1. Observe your garden. Most vegetables are very adaptable. Plants may wilt during the hottest part of the day but then spring back to life by evening. This is their way of coping with heat. Understanding how plants respond to temperature, as well as soil moisture, should avoid knee-jerk reactions that may waste precious water. 2. Protect your soil. Mulches of organic material will serve you well in hot summers by slowing the loss of soil moisture. Further generous additions of organic matter laid over bare ground will build long-term soil structure and its ability to retain moisture. 3. Water early in the day. Splosh the wet stuff with extravagance at planting time. Fill planting holes to the brim and let them drain through. Then repeat. Now plant your seedling or transplant. The moisture will travel deep down into the soil, encouraging the young roots to follow. 4. Water after rain. Believe it or not the best time to water is after rain, when the ground has been softened and is more receptive. Extra water at this point tops up the rainfall, so it can penetrate further down into the soil. This is a great way to build up meaningful soil moisture. Check out my other tips on watering wisely (and here too!) and the best watering strategies for optimal taste. Please share your own watering tips below; I’m particularly interested in hearing from those in very hot climates – what works for you? Share your ideas and let’s keep our crops quenched and happy this summer! "i have a drip system, garden is slightly raised bed , with salt marsh hay mulch, well drained sandy loam on Cape Cod. Should I 1) water every day just a bit to maintain an even level of moisture OR 2) Water heavily less frequently "
"Hi Peter. Although we have sandy soil, I would always recommend watering heavily, less frequently. Of course, with very free draining soil you have to play it by eye. Observe healthy crops are responding to this frequency of watering, and tweak your quantity and frequency accordingly. But at the end of the day, more water less often encourages roots downwards so that plants are more independent."